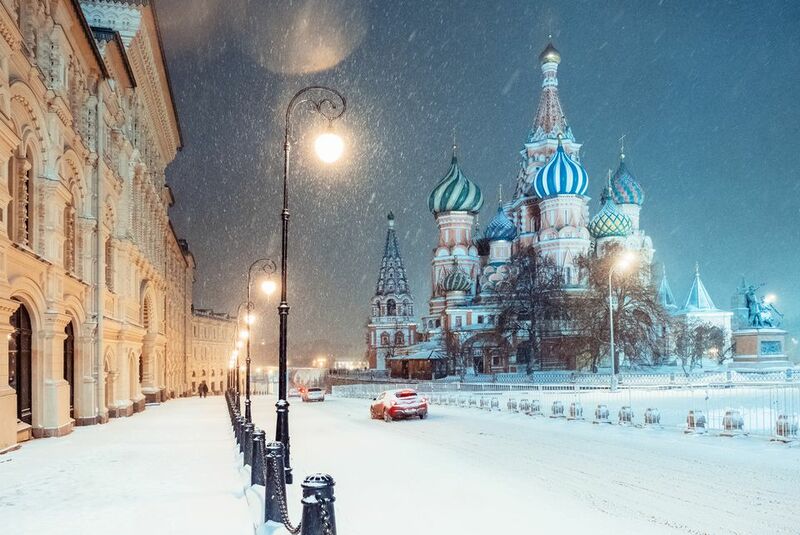 Travel to Moscow during winter is a unique experience, and you will not lack for things to do and see. Russians are experts at making the cold season fun and festive, so whether you are outdoors braving the chilly temperatures or indoors and safe from the cold, there are a variety of activities to keep you busy during this time. Winter is time for the exciting winter festivals, enjoying ice sculptures and getting outside for skating and cross-country skiing. Ice skating rinks are plentiful in Moscow during winter. In the heart of historic Moscow, there is an ice rink in front of the GUM department store in Red Square every year. There are more than 45 rinks in Moscow. Other popular ice skating rinks can be found at Gorky Park, Sokolniki Park, Izmailovsky Park, and Patriarch's Pond. Gorky Park usually features the largest artificial ice rink. It is so large that it is estimated that it can take 10 to 15 minutes on average to skate around the rink. Boat cruises down the Moscow River offer a special view of Moscow. Previously only available during the warm seasons, you can take an icebreaker boat cruise that can break up the ice that crusts over the river during the winter. You can enjoy dinner or lunch during this 2-hour cruise while viewing the snow-capped sights of Moscow from within the glass-enclosed deck. Ice sculptors show off their skills in Moscow during winter. Usually, scaled-down models of various parts of Russian cities are made of ice. Ice sculpting competitions are organized on an annual basis at various venues, including Sokolniki Park and Park Pobedy, and feature various themes. If you are traveling with the kids, check out the ​snow art school in Perovsky Park where they teach children how to build sculptures from snow and ice using special techniques. The snow is so plentiful in Moscow during winter that it is possible to create legions of snowmen within a small area. Look for snowman parades on Arbat Street and elsewhere in Moscow. Keep on the lookout for snowmen competitions, which are likely after a heavy snowfall. An annual competition called "Art on Snow" takes place in Moscow's Sokolniki Park. Dozens of families participate in creating temporary masterpieces on the smooth white canvas nature provides during winter. Russians love to celebrate the winter weather and the holidays. Moscow's Russian Winter Festival coincides with other winter festivals across Russia, but due to its popularity and the city's resources, the Moscow version of the Russian Winter Festival is a huge event, running from mid-December to mid-January. Other popular winter festivals include Moscow's December Nights, New Year's Eve festivities in Red Square, and finally Maslenitsa, which heralds the end of winter and coincides with the start of the Lenten season. In addition to ice skating, more than 40 parks throughout Moscow offer dozens of ski tracks and walking paths. Ski tracks are largely illuminated and have heated locker rooms and rental points. Also, visitors to a majority of those parks can enjoy tubing and ice slides. Winter gear, including skates, skis, sleds, tubes, and snowboards, are available on-site.